Being on-board like being at home, or in a villa: Ferretti Yachts 720 gives birth to high-end sailing, an unprecedented experience of luxury, comfort, and well-being, the result of meticulous attention to the quality of the design, the furnishings, and the details. 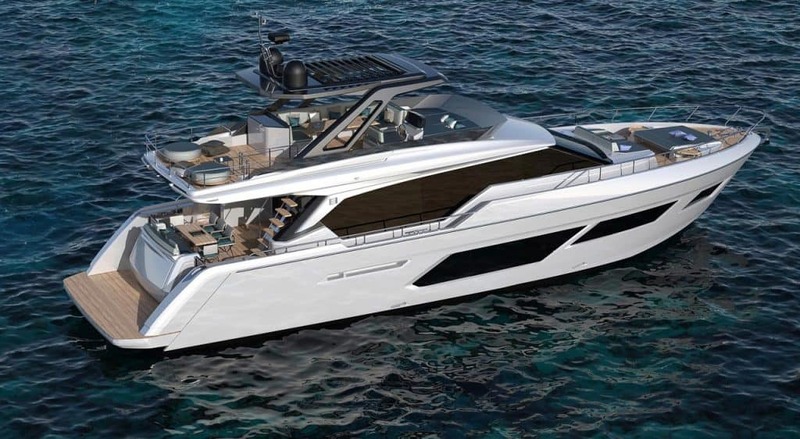 Created in tandem by Ferretti Group’s Product Strategy Committee and Engineering Department, Ferretti Yachts 720 is the second project to sport an exterior designed by architect Filippo Salvetti in collaboration with Ferretti Group. The interior design, on the other hand, was created by the Group’s own architects and designers. In keeping with the innovation process implemented on recent models, the external forward area stands out for its spacious, interchangeable living areas. The generous 30m² flybridge, in carbon fibre and composite materials, is surmounted by a hard top available in 3 different versions: fixed window, built-in bimini, or adjustable louvres. A large open-plan space is organised into three zones: the living area features two ample facing sofas and is separated from the raised dining area, which offers a remarkable degree of comfort for a yacht this size.